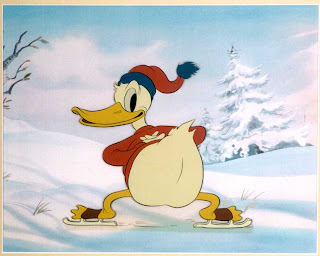 Tune in to the 1938 Mickey Mouse Theater of the Air! 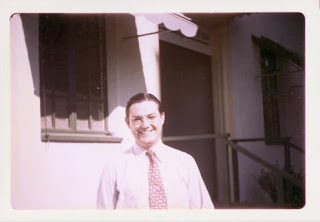 Found on www.archive.org. 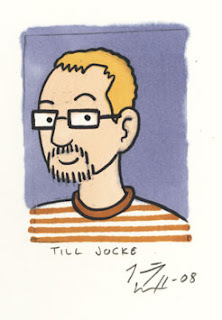 Thanks to Per Starbäck who mentioned it on Facebook. 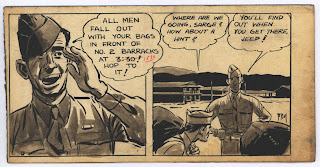 I recently bought these two strips on eBay. Both are by Fred Ray and signed "FRAY". 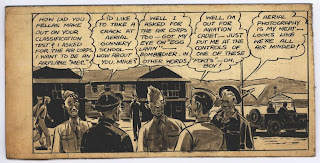 Notice how he uses light and shadow just like Noel Sickles did. And, yes, he was a big fan of Sickles. 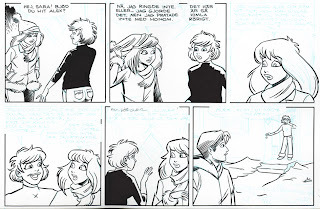 It was from Fred's collection Alex Toth and some other artists got their Schorcy Smith sets a long time ago. 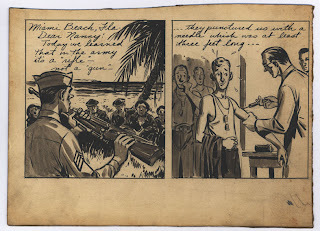 I suspect these were drawn while he was doing his military service during the early/mid 40's. But does anyone know where these were published? If they were published at all. They seem to be aimed to people not in the army since they explain how things are in the army. If you have any clues please leave a comment. I was talking to my girlfriend on the phone two days ago, while sketching on a piece of scrap paper. 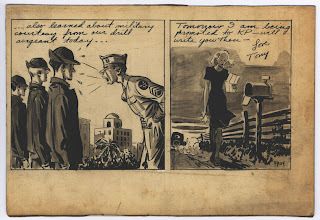 Coming up tomorrow: Two original strips by Fred Ray, with a (heavy) touch of inspiration from Noel Sickles. Oo, kung ano ang maaaring maging ito? 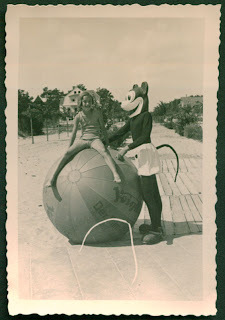 And I like Mickey Mouse. I actually prefer Egmonts coloring (too many gradients on this version) but it's nice to see without all the text and stuff covering the art. And the dutch version have so much more depth thanks to the smart desicion to not cover the end of the card tower. 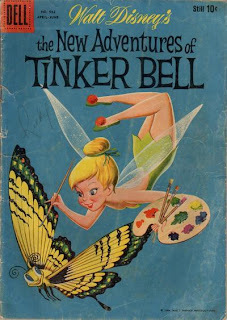 Then a nice Scamp cover by an unidentified artist. I really like when the artists are using black as a dominant color on a cover. 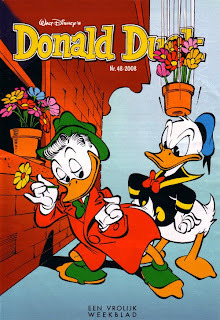 And I miss having other characters than the ducks on the covers of the Donald Duck weekly in Scandinavia. Using Mickey, Goofy etc now and then gives some variation, you know. 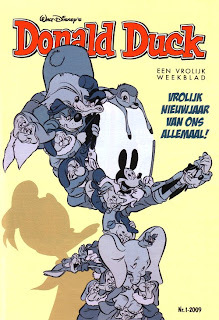 And finally the cover of next weeks DD with artwork by Gerben Valkema. I just can't imagine how long time it must have taken to figure out how to fit all the characters together to do this image. :) Let's hope this will be used in Scandinavia too. 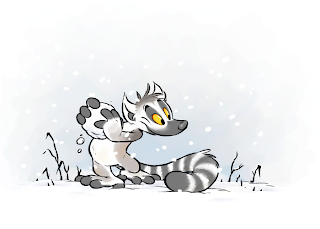 Henrieke also sent me the lemur drawing below! 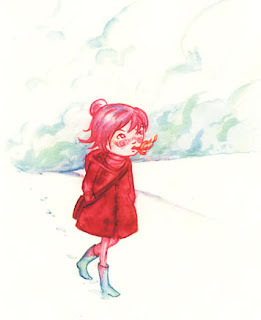 If you want to see more of her artwork you should visit her blog Ducks and Lemurs. Now, back to the Christmas candy and the family. Only 5 minutes left until Disney's "From all of us..." begins. Gotta go! A wonderful claymation Krazy Kat Kartoon made by Banana Park. Thanks to Sofia for showing me this yesterday. 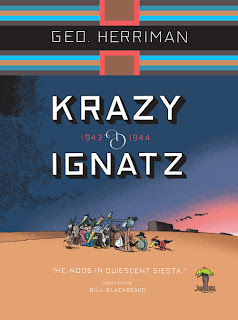 And speaking of the Kat don't miss the new Krazy & Ignatz book from Fantagraphics! It's filled with loads of extra bonus material. A pleasure for the eye and a delightful, weird piece of comic art. Beautiful cover art... Nuff said. Finally finished the E&S page. It's scanned and ready to be colored. 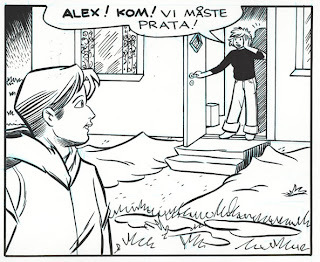 Remember this Mickey Mouse panel that I showed here in November? 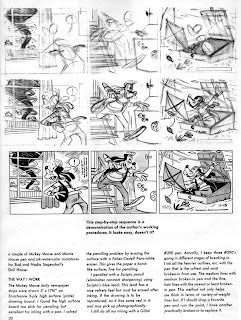 And yesterday David Gerstein left a comment that I think deserves to be read by all not just those browsing through old posts: >>>According to Floyd Norman (with whom I chatted about this), it's really an urban legend that the comic strip originals were sent to Western. 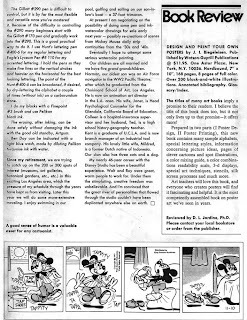 If they really had been, it stands to reason that there would be no original, uncut dailies left from any of the Mickey stories Western serialized. But a handful of originals do survive from almost every continuity Western used. Apparently, what actually happened was that Frank Reilly just told everyone one day that all originals prior to a certain year (might have been 1955), which were then being stored in some room, were to be destroyed. Staffers had a few days to dig through them and save whatever they wanted. After those few days were up, sure enough... the remainder bit the bullet. But quite a number were saved, and it's those that were slowly dispersed and account for the several hundred (or so) on the market today. The vast majority of originals from after that period still survive at Disney, held in big boxes of more than a hundred apiece. 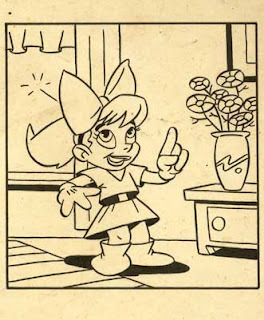 Now... back to that Taliaferro panel that we're seeing here. Why was it cut out? Maybe because it wasn't used in the final ZM 38-01-30 at all! I'm looking at the strip in its newspaper format now, and the corresponding panel matches WDC&S, not the original at you showed. No gun, Mickey is walking rather than standing still and the crooks are seen from the back, not the front. Why the change? 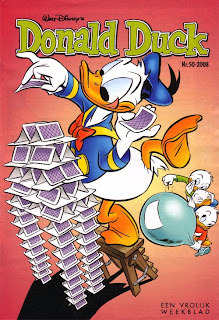 IMHO, because letting Mickey catch the dropped gun and use it softens the gag. It's funnier to have Mickey subdue the crooks without any weapon at all, entirely due to their misinterpretation of the car's backfiring sound. Thanks for sharing this info, David! 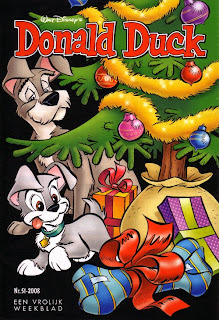 And yesterday Sofia Falkenhem gave me this x-mas card. I just had to show it here. 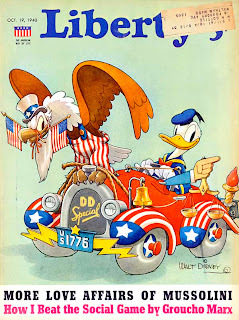 Just bought some Gottfredson artwork today. "Just off for a short trip". But what's the big deal making a post card about it?!? And why am I asking such stupid questions? But then, what strange animal is this??? "Other stuff you'll like" link list. 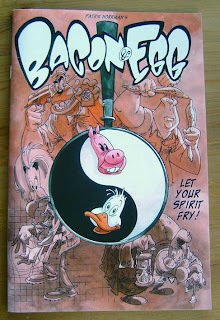 If you are a fan of Patik Norrman's "Bacon & Egg" here's a rarity to look for. 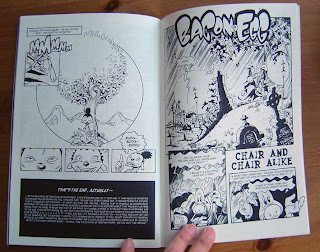 Privately printed by Patrik himself in an edition of 100 copies (if I remember right). It contains a few stories in black and white translated into english. 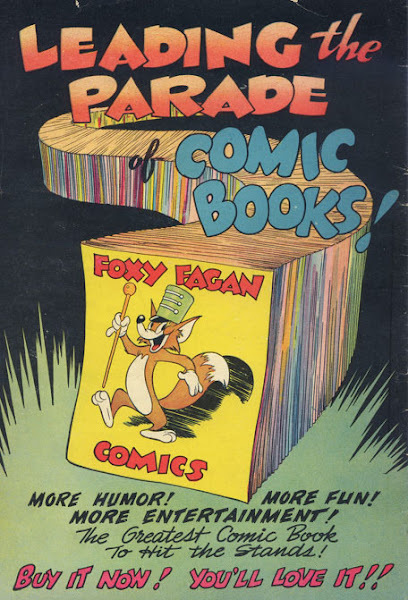 The publication was brought to San Diego Comic-Con several years ago and given away to publishers. Now, try to track one down. Good luck! Gunnar Andreassen sent me these photos he found on flickr a while ago. 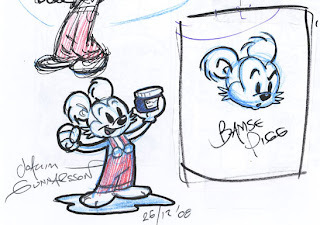 Now, besides Gottfredson who are the other two? Anyone who knows? 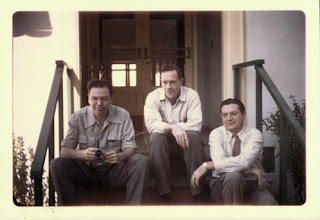 And does anyone have photos from inside the Comic Strip dept building? 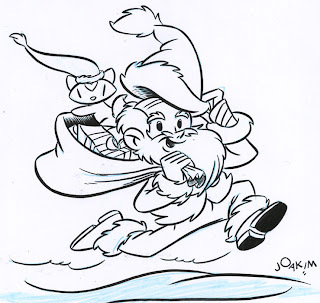 Here's the final part of the Gottfredson piece. Myself I'm currently in a Walt Kelly mode, since I found a stack of sunday sections with Pogo from 1966-1967 in my closet. I had no idea that I had those and I've never read them before. 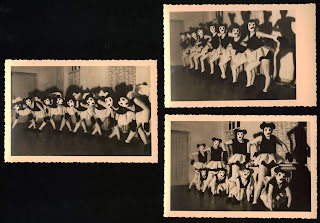 So I've been enjoying the famous Prehysterical Pogo in Pandemonia sequence now. :) (What a thing to find in your own closet...) Great artwork in those sundays. You can tell he had fun doing the dinosaurs and the prehistorical trees.